Model Driven Architecture (MDA) Transformations provide a fully configurable way of converting model elements and model fragments from one domain to another. This typically involves converting Platform-Independent Model (PIM) elements to Platform-Specific Model (PSM) elements. A single element from the PIM can be responsible for creating multiple PSM elements across multiple domains. Transformations are a huge productivity boost, and reduce the necessity of manually implementing stock Classes and elements for a particular implementation domain; for example, database tables generated from persistent PIM Classes. Enterprise Architect includes a number of basic built-in Transformations, and further Transformations will become available over time, either built in or as downloadable modules from the Sparx Systems website. For a further productivity boost, Enterprise Architect can automatically generate code for your transformed Classes that target code languages. A Transformation is defined using Enterprise Architect's simple code generation template language, and involves no more than writing a template to create a simple intermediary source file; Enterprise Architect reads the source file and binds that to the new PSM. Enterprise Architect also creates internal bindings (Transformation Dependencies) between each PSM created and the original PIM. This is essential, as it enables you to forward synchronize from the PIM to the PSM many times, adding or deleting features as you go; for example, adding a new attribute to a PIM Class can be forward synchronized to a new column in the Data Model. You can observe the Transformation Dependencies for a package using the Traceability window; this enables you to check the impact of changes to a PIM element on the corresponding elements in each generated PSM, or to verify where a change required in a PSM should be initiated in the PIM (and also to reflect back in other PSMs). 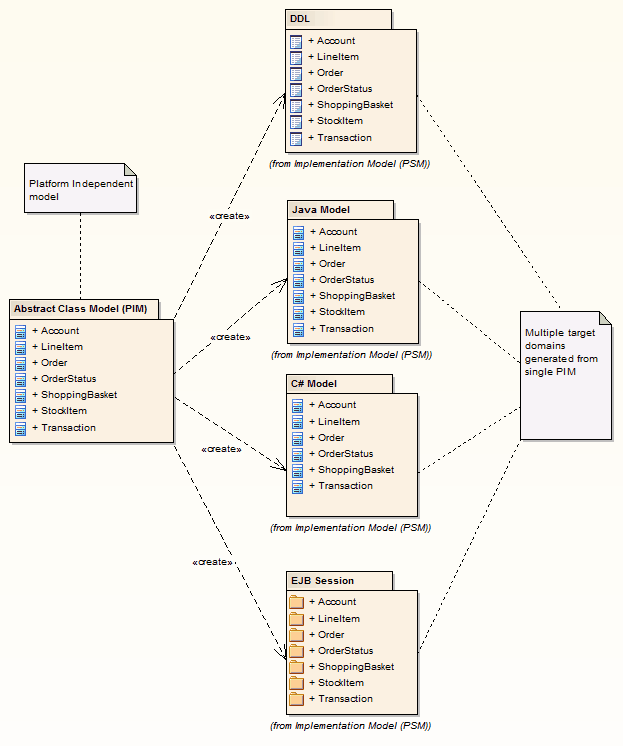 The Transformation Dependencies are a valuable tool in managing the traceability of your models. Enterprise Architect does not delete or overwrite any element features that were not originally generated by the transform; therefore, you can add new methods to your elements, and Enterprise Architect does not act on them during the forward generation process.